A very generous new American Express offer with Tesco has appeared on a lot of Gold and Platinum cards, although unfortunately not on any in our house. You need to look under the ‘Offers’ tab on your online statement page. If targeted, you will receive 400 bonus Membership Rewards points for a £10 Tesco spend. This is worth 400 Avios, 400 Virgin Atlantic miles, 600 Marriott points, 800 Hilton points etc. Going substantially more upmarket, Peninsula Hotels is offering £100 back on a £500 spend, valid until the end of the year. The Chicago and Manila hotels are excluded. If you were thinking of taking advantage of this, our hotel booking partner Emyr Thomas can access exclusive Peninsula benefits for you via PenClub. You would pay the standard Best Flexible Rate but also receive free breakfast, $100 food and beverage credit, flexible check-in and check-out times, upgraded room amenities and a room upgrade if available at check-in. These are ‘pay on departure’ rates so they would also trigger the Amex £100 cashback. You can contact Emyr via the form on this page. 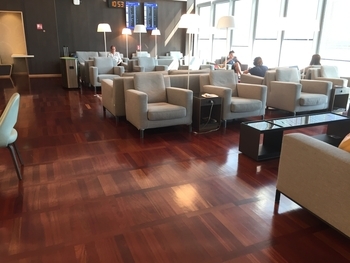 When we were flying out of Venice two weeks ago, I was delighted to see that – as part of a major airport redevelopment – the Marco Polo lounge used by British Airways passengers (it is also in Priority Pass and Amex Gold‘s Lounge Club) has been overhauled. The two photos above and below do not really do it justice. There is now an outdoor terrace, an indoor Winter garden and decent food, and the variety of seating works well for solo business travellers as well as holidaying families. There is even a barista – you are not allowed to make your own coffee! One other benefit from the redevelopment is that there is now a direct elevated travelator link between the water taxi dock and the terminal. You do not need to weave your way through the car park in the rain any longer. If you have been to the Marco Polo lounge in Venice before and been disappointed, I recommend trying it again. Finally, we are giving away a £50 LivingSocial voucher, valid for any of their daily deals, over at Shopper Points today. Click here for the article. It will only take 30 seconds to enter. OT: has anyone been able to confirm whether the £100 back on £500 Hilton US in store spend works when buying online? Which airline are you using? For example, with American Airlines you pay for your checked bags at the airport. OT: Has anyone had success with Hyatt £60 off £300 (Amex) with a prepaid rate? I’ve used it successfully at checkout, but have it on multiple cards, with a scheduled Hyatt stay unfortunately after the offer expiry date. OT Amex spg compensation for complaint – what were people getting? I got offered cash credit instead of points which I found odd. Is this for the retention offer or generally missing points issue? … did you need to go down the formal complaint route? OT, IHG premium credit card related. Purchased something online abroad and paid with IHG cc a month ago. Just been advised today that the purchase cost would only attract 2 IHG points per pound rather than 4 points per pound despite 3% FX being charged. 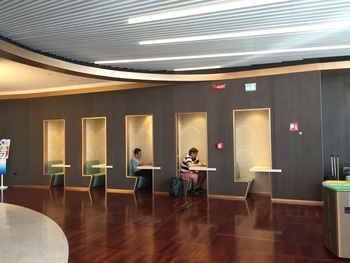 It appeared that all international online payment will only receive basis 2 IHG points only rather than 4 IHG points for an international transaction. OT, I’ve just pretty much checked the whole of April 2019 for Avios reward availability via BA for CX flights HKG-AMS and HKG-SIN with nothing showing at all. This is very odd. OT – if I book a 241 redemption from LHR now, can I alter the booking before departure if necessary to begin and end in Belfast, in a straightforward manner? Is there the option of changing departure of booking online in manage my booking or is it a cancel the whole thing and rebook job? The call centre can do it for £35 change fee, you would keep the same booking reference.